Speak your TRUTH, play with words, tease your IMAGINATION Say whatever YOU want to SAY good or bad... Fully embrace the WONDERful person YOU ARE and the INCREDIBLE world you live in. Take Art and Ryalls Park Medical Practice in Yeovil deliver the project, which is currently fund-raising for its third phase, running from January 2019 with two groups of 6 -10 participants. One of the key elements of Word/Play is that it works closely with Yeovil’s newly appointed Health Visitors, who are based at local surgeries, responsible for providing a holistic approach to the wellbeing of their patients. The Health visitors are able to identify patients that they feel might benefit from the project and encourage them to try a taster session. Working with professional performance poets Liv Torc and Roz Hilton for ten+ weekly sessions, participants take part in spoken-word workshops at the GP surgery, where they are given the chance to build their confidence, develop skills and find new ways to communicate in a safe and fun environment. No previous writing or spoken word experience necessary. Sessions are accessible to everyone and are aimed at creating a sense of fun and comradely within the group. 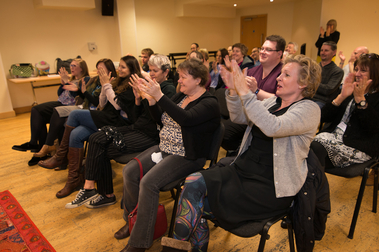 The ten week course ends with an informal performance in front of friends and family at the Octagon Theatre, Yeovil. Word/Play Plus is a new strand of the project aimed at continued support for participants, so they don’t end up stepping of a metaphorical cliff after the project ends. 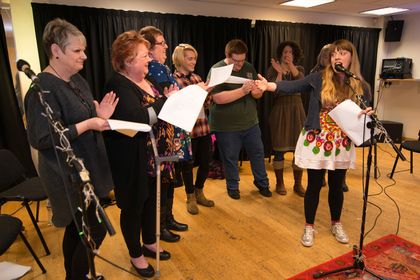 From previous incarnations of the project we identified that participants wanted to continue to work creatively and find opportunities to write and perform. 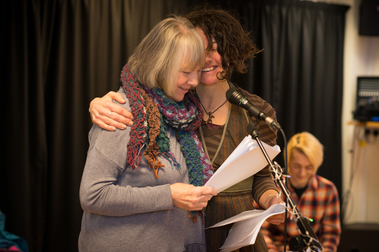 In November 2017 we launched Word/Play Plus, a group where former participants can meet for monthly workshops led by a professional performance poet. This allows them to keep continuity and continue to use writing and performing as a technique for managing their mental health. 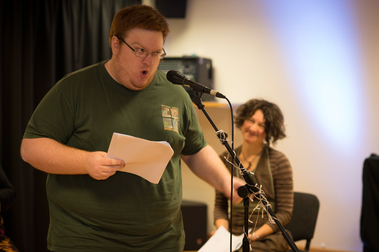 Since starting Word/Play plus participants have met and performed regularly, taking part in local poetry events and slams. 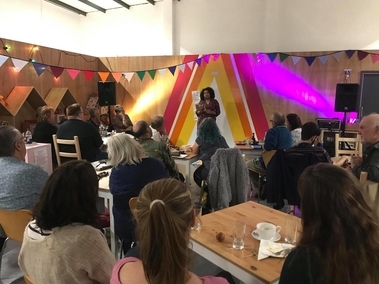 In-between the workshops Take Art has helped participants set up their own open mic night in Yeovil, the Rainbow Fish Speak Easy, a spoken word and live poetry platform where they and other writers and performers in the area can regularly meet and perform in a fun and safe environment. 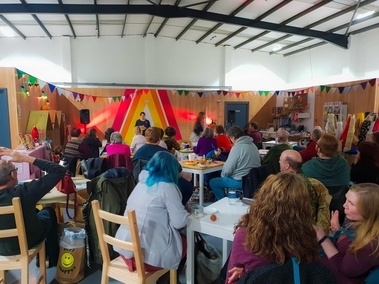 The night is topped off with a big headline act and has become a hugely popular poetry platform in Somerset. The Rainbow Fish Speak Easy has been running for over a year and is currently taking place bi-monthly at The Hub, Yeovil. 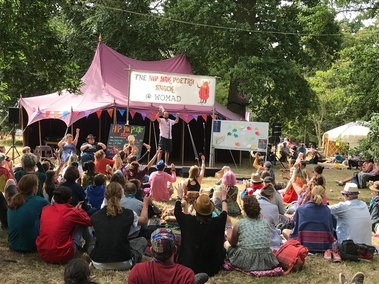 In 2018 it was invited to tour to Buddhafield and WOMAD festivals. Please visit our What's On to see when the next Rainbow Fish is taking place. 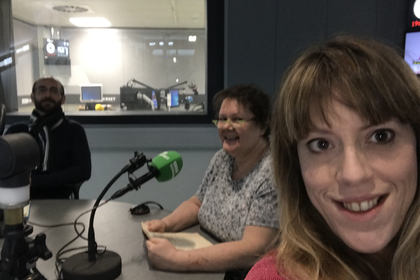 Take Art's amazing social prescribing Word/Play project had a blast of publicity last week when it made it onto BBC Somerset online and BBC Radio Somerset. Check out the story here. 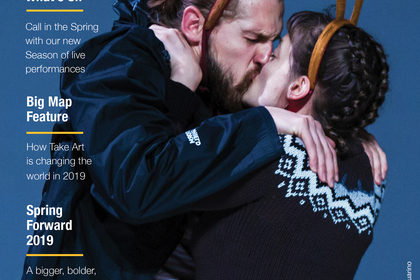 A New Year approaches and with it the launch of our 2019 Jan-Jun programme. Check out all the brilliant shows and projects happening on your doorstep and in your community.